Since yellow is my favorite color it is only natural that I love sunflowers. They are one of my favorite summer flowers. 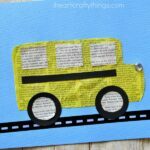 My new obsession with watercolor painted newspaper had me dreaming up how to make a pretty sunflower craft and I’m ecstatic to share how it turned out today with you. I love the texture that newspaper brings to crafts and I adore the vibrant colors of liquid watercolors on the newsprint. Plus, it’s always a bonus to use recyclable materials any time you can. 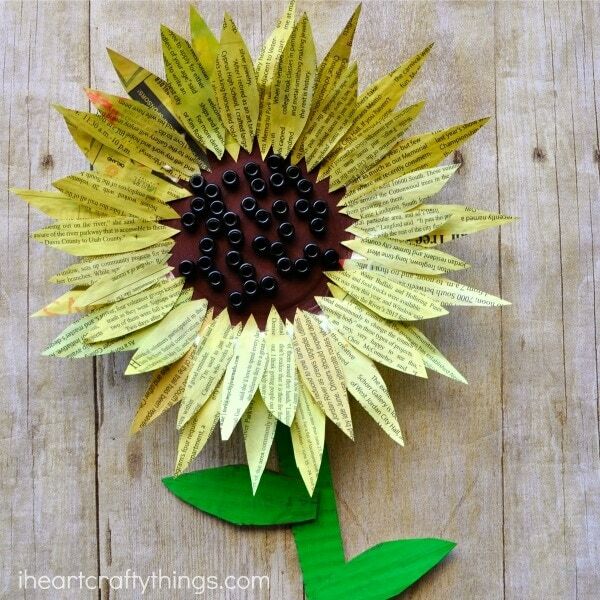 This painted newspaper sunflower craft is gorgeous and is perfect for summer crafting. 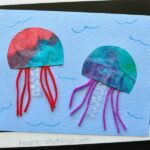 Look for some fun books to go along with this craft at the bottom of this post. 1. Start by painting your newspaper with your yellow liquid watercolors. I definitely recommend liquid watercolors for a project like this since you’ll be painting a large area. Plan on about a half sheet to a whole sheet of newspaper sheet for one flower. Let the newspaper sit for several hours until it is completely dry. 2. 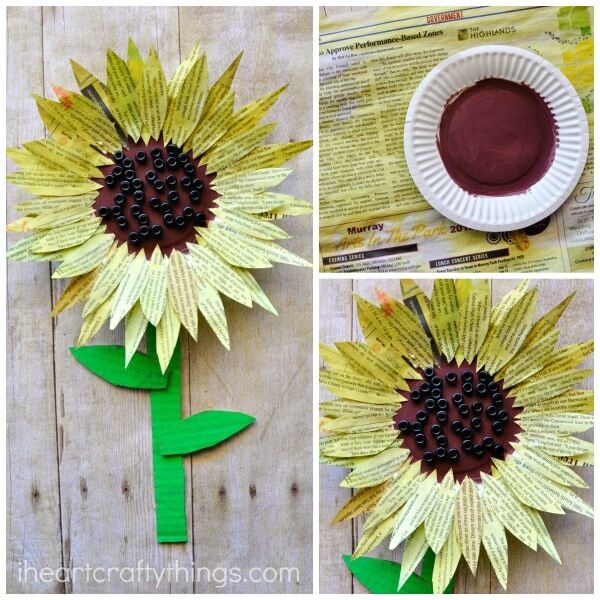 Paint the inside circle of your small paper plate with your brown paint. 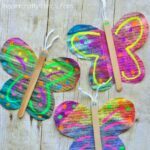 Cut out a flower stem and leaves from your cardboard and paint them with your green paint. 3. 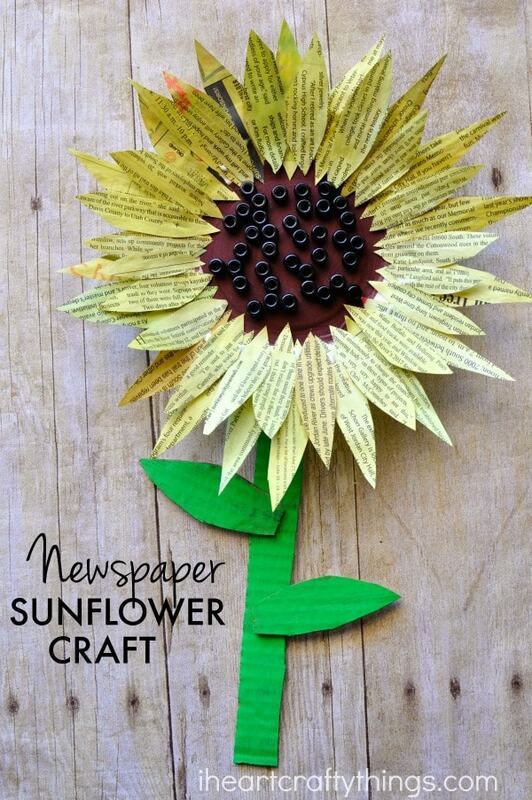 Cut a handful of yellow petals from your painted newspaper. Add glue around the inside rim of your paper plate and start to add your petals around the paper plate. We added two layers of leaves to make a fuller sunflower. 4. Add glue in the center of your sunflower and glue on black pony beads for your growing sunflower seeds.